After spending the day at Kings Island, we decided we wanted to check out Camden Park. We had heard nothing but great things about the park, and we really wanted to check it out. Two of the five remaining coasters with National Amusement Device (NAD) Trains, are at the park. The other three remaining coasters that run with fully intact NAD trains are the Kennywood Thunderbolt, Conneaut Lake Park Blue Streak, and the Kiddie Coaster at Rye Playland. Camden Park's two coasters are two of the last four remaining coasters designed by NAD, with the other two being the Kiddie Coaster at Rye Playland, and Montaña Rusa at La Feria Chapultepec Magico in Mexico City, Mexico. Below you can see the park's Big Dipper. The rolling stock on this coaster is a single NAD Century Flyer train. As to be expected with these NAD Century Flyer trains, the ejector airtime towards the back of the train was awesome. This is a zippy and fun little ride that offers more airtime and thrills than coasters twice its size. As is the story with many parks, this park opened as a trolley park around the turn of the century in 1902. An Adena Indian mound lies undisturbed within the center of the park that is estimated to date back to 1000 BCE. A number of other mounds once existed around the Huntingdon area that were all disturbed and destroyed when people wanted to develop their sites. This is one of the few that remains intact. We rode everything in the park and had a delightful time. The next ride was the Paratrooper. The laid back experience in the park is exactly what we love in parks. We could just relax and take in the park. No large and rowdy crowds, no one hounding you to spend more money at the park. It was great. That evening was easily one of the best we have ever had in a park. Here is the park's newest ride in action, the Rattler. This Zamperla Mini-Discovery, Pendulum ride is a ton of fun. It seems like the smaller the pendulum ride, the more intense they become. While this does not offer the height of Zamperla and Huss's giant pendulum rides, it seems to offer a more powerful ride for you are constantly reaching the end of the arc of the ride. The Rattler is an awesome ride. Disorienting view looking at both of these rides spinning at the same time. Now onto the Big Dipper! An awesome ride with some great pops of ejector airtime towards the back of the ride. The carousel is a 1925 Spillman unit that had its wooden horses replaced with decent Herschel aluminum horses at some point. It is a fun carousel. I always love seeing Spillman and Herschell works. The park's set of Modern Larson Flyers was not in operation that day. In the center of the park they had this stage all set up with a decent band playing. The placement of the stage allows for the music to be heard throughout the entire park. It created a really festive and relaxing atmosphere. Instead of having a park band providing entertainment, they host local bands, providing for a genuine musical experience on top of the fun of the park. After riding the Scrambler we decided to ride the park's Mangels Whip. This Whip is all around spectacular. I always love riding Mangels Whips, but this one is different from all of the others I have experienced in that there is only 15 feet or so between the two wheels. Instead of having that moment to take a breath after going around the flywheel on the ride, you are almost immediately on the next flywheel. Add into this that the ride is run faster than many of the other rides of its type, this ride experience is awesome! That raised area behind the Whip is the Adena Indian Mound. It is heavily grown in. We will take a look at some comparison shots to several other Mangels Whips. You can see how much longer a typical whip is. The length between the flywheels is significantly shorter on the Camden Park Whip, and it runs much faster as well, providing for a much more powerful ride. You really cannot go wrong with a Mangels Whip though for they are always fun. Sidetracking a minute, you may notice that I often mention in my park visit reports that a park has something that is "the best, or "my favorite." I usually find at least one thing in each park I visit that is remarkable and I seldom feel like I have experienced a bad day at a park. There is something really special about Camden. It is a nice and accessible small park with a great selection of rides. The park has a nice little train ride that makes a small circle through the park. The park's log flume is very nice. This is one of the last handcarts attractions remaining. Rides that emphasize physical activity are great for the kids. I recall when those four wheel Jeep toys were very popular I asked my parents for one and they said that I can deal with and will be better off riding my bike around. They were right. It is great to see these old rides that have that same emphasis for the little ones. The park has a great assortment of kid rides, making this a great place to take a family. The park also has this old sky ride named Skyliner. I am not certain of the manufacturer of these old sky rides. Does anyone know? The park also has a nice miniature golf course. A view of the next coaster on the agenda, the Little Dipper. This is one of only four remaining NAD designed coasters like the Big Dipper across the park. This design was duplicated for multiple parks when it was produced, and now it is only two of this specific design, with the other being located at Rye Playland on Long Island in New York, a bucket list park for me that was featured in the movie "Big" with Tom Hanks, and often talked about during Mad Men. Overall, I highly recommend visiting this old park. All of the rides are great, and the atmosphere is very relaxing. This is a great place to spend an evening. It is less expensive than going to the movie theater at only nine dollars a person. This park encompasses everything a community amusement park should. It is affordable, the rides are great, the food is inexpensive, and there are a number of great activities to do. The park's two rare NAD coasters are excellent, the park's rare Gravity Pretzel ride is world class, along with the Whip, which I believe is the most powerful that I have experienced. Everything about this park is great. We had as much fun on that evening as we have experienced in any park and I highly recommend making a visit. On the Sunday of Memorial Day Weekend 2015 we decided to make the drive to Cincinnati and visit the giant Kings Island Amusement Park. As always, the first view as you walk in to the park is stunning. The 315 foot replica of the Eiffel Tower makes for a grand entrance into the park, along with the fountains. The photos are a mix of mine and Brit's. Our first stop was at Kings Island's most recent coaster, the 2014 Banshee B&M Inverted Coaster. At 4,124 feet it is the longest Bolliger and Mabillard invert ever made. At 167 feet tall with an 150 foot drop, it is one of the tallest coasters of its type. Unlike most B&M inverted coasters, the train goes right into the drop as opposed to turning then dropping, a disorienting effect that increases the thrill in this ride. This coaster replaced the short-lived Son of Beast coaster. Banshee also has a custom layout that traverses a hillside, similar to its legendary coaster sibling across the park, the Beast. This is in no doubt a fun ride that has one of the most different layouts of any coaster out there. 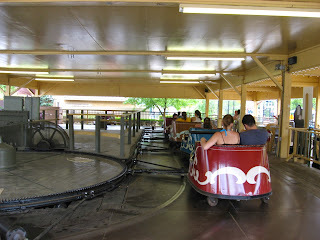 Unlike most coasters, it does not reach top speed until midway through the ride. There is an elevation change exceeding 200 feet on this coaster, thanks to the terrain it was built upon. Because of this, the train reaches speeds of 68 miles per hour, providing for a really zippy ride and the fastest of any B&M Inverted coaster. Brit caught the Banshee lady shoeing away the train. Now on to Top Gun/Flight Deck/the Bat. The Bat is one forceful coaster, perhaps second most forceful steel coaster in the park to Vortex. The layout on this is so forceful and imaginative. The second drop catches me by surprise every time, heading down a cliff. This coaster is the last built Arrow suspended coaster and arguably the best. This is a very fun ride. Some of the best views of Banshee come from this ride's queue. It occurred to me that this looks like a giant B&M Invert version of the coaster in the building on the right, Premier's Flight of Fear coaster. All of the tangled up track looks awfully similar to that. Next we headed to the Racer, the John Allen classic that is running in the best shape I have ever ridden it in. There was decent airtime on every hill. It really hauled through the course. Most of Kings Island's coasters do not feature airtime as a primary feature of the ride. The Racer is all airtime and it really delivered this past visit. It is an excellent ride. Diamondback is beckoning us, but we will ride it soon enough. Vortex is beckoning as well. We will get there in due time. Next up is Windseeker. The placement of this tower is great, with it being surrounded with coasters. The views it gives of the secluded Beast are unmatched, along with the park's other rides. Vortex time! This is one forceful ride, and one of the best of the Arrow Megaloopers. Heading over to Beast, you cannot help but stop and take some pictures. Brit figured she would take a picture of me in action..
We will get to Diamondback in due time as well..
Lots of cool views of the coasters throughout the park. Beast time! For a coaster to garner a full queue speaks a lot about the ride. While the trim brakes may have been on heavier than they were in the cold autumn air last fall, this is still a fun ride. The wooden coaster bracing system that Cedar Fair utilizes really helps to keep the track true and the rides smooth. The Beast is greatly improved from where it was a few years ago, with it running in top form back in the fall. Racer was running the best I have ever experienced it on this visit. Blue Streak and Mean Streak up at Cedar Point were running the best they ever have in my experiences on them last season as well. There were no riders on this train because they had just added another train onto the track. Now with personification, she's back! My favorite ride in the park after Racer and Banshee is Diamondback. It is also my favorite B&M Hyper coaster. The ride offers some serious floater airtime, with the very comfortable and non-restrictive B&M clamshell lapbars. I like to extend my legs on every ride. With how high up the chairs are off of the floor, for all intents and purposes this coaster feels like it is floorless. When riding this coaster you feel like you are gliding through the air. The water splashdown effect is always a crowd favorite and a cool sight to see from the midway. One more view of that giant drop. And a little more of the park's Blueberry Ice Cream. We had a nice morning and afternoon at the park. One more lap on Banshee! The park had some military vehicles displayed to commemorate Memorial Day. The front gate photographers were doing their best impressions of the folks from the MASH 4077 running towards the truck. There must have been twenty of them trying to take everyone's pictures as people entered the park.